Our philosophy is simple – happiest people make happiest customers. Our mission is a constant reminder of the fact that we are in the business of making our customers happy through happy employees. People are an integral part of our business and their happiness is of utmost importance. Our systems, policies, and practices are crafted to foster an open culture, enabling our people to discover their potential and participate in shaping their own work life experience. This is how we make a difference. Though happiness is a very personal emotion, we believe that it is the organization’s responsibility to create enabling conditions for a person to be happy. Culture of teamwork and sharing knowledge and wealth. Attentive, caring, heedful. Mindful of our responsibilities. Respect our commitments internally and externally, not just in letter, but also in spirit. Creating an organization that stands for fiscal, social and professional integrity. A culture that rewards self-development and innovation. High aspirations for global excellence backed by a strong action orientation. Good corporate citizen with a special emphasis on environmental responsibility and driving inclusivity in the workplace. At Happiest Minds, we have identified a few predictive factors that enable happiness. Some of them are organizational factors such as fairness, transparency and joy in workplace. The others are individual oriented, such as wellness, enriched personal life and giving back to society. 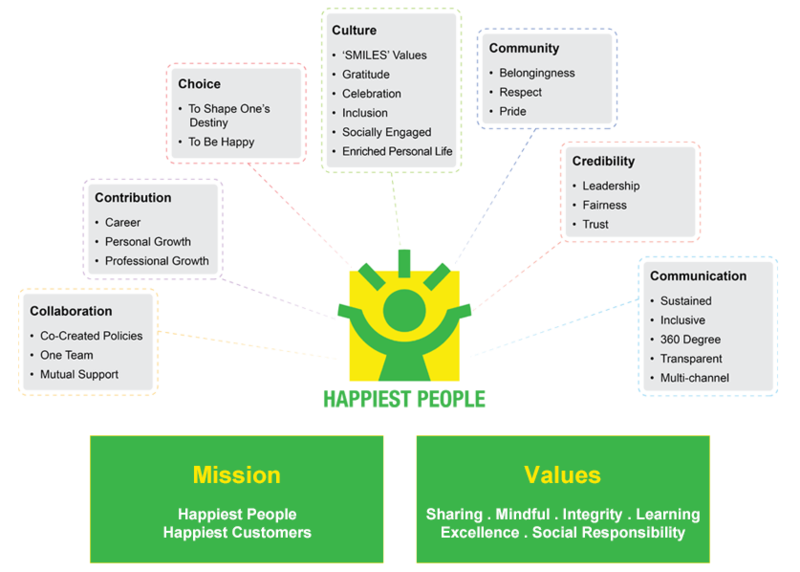 The Happiest People Framework is built on the 7Cs of Culture, Credibility, Collaboration, Contribution, Communication, Community and Choice. We believe that happiest people are more creative, innovative and deliver more value to customers making customers happiest. The Happiest Minds’ Wellness Program constitutes the 7Ws of Physical Wellness, Spiritual Wellness, Intellectual Wellness, Professional Wellness, Social Wellness, Emotional Wellness and Environmental Wellness. These are nurtured by aligning activities, logistics, facilities and expertise of the organization through an array of Wellness schemes. Wellness Physical Wellness is achieved by proactively participating in both outdoor and indoor activities to enhance stamina, endurance and fitness. This includes walking, running, aerobics, health check-ups and sports. Wellness Spirituality is about getting attuned with oneself. Happiest Minds encourages its people to do so by engaging in activities like Yoga, Meditation and Breathing exercises to help pursue self-discovery. Wellness A great share of satisfaction emerges out of the positive results of using the intellect. Happiest Minds helps sharpen this quotient by facilitating training that would develop technical, leadership and soft skills. Wellness Happiest Minds drives its idea of Professional Wellness through a range of activities like Competency Building, 360 degree feedback based Performance Enhancement Processes and Talent Reviews. Wellness Happiest Minds helps its people to strike the right balance between their personal and professional lives by sharpening their Social Wellness quotient through events such as Group activities, Celebrations, Get-togethers, Blood donation camps, Circle of Happiness and Diversity initiatives such as Aura, the Women’s council. Wellness Emotional Wellness is a vital virtue. This is fostered through a wide range of activities such as Good Samaritan Network, Buddy programs, Stress Management lessons and Mentoring. Wellness Happiest Minds strives to instil environmental awareness through activities such as Recycling, Environment Week, I Change my City program, Waste management and Power conservation initiatives. Social Responsibility is a core value of Happiest Minds. It is also one of our vision statements where we have set out to "be a leader in integrating social responsibility initiatives with core business operations". Establishes volunteering & community involvement. Celebrates our important milestones with acts of giving. Executes a process for leveraging our capabilities and contribute to socially relevant causes. and builds a social engagement program that enables us to engage with clients & partners and make a difference to society and the environment. A core team anchors this program, defines its charter at a granular level, interfaces with social organizations and coordinates volunteer activities. At our launch, at the completion of the full financial year and US$ 5 million quarter and at other SMILESTONES, mid-day meals were sponsored at Akshayapatra Foundation. We are hoping to cross a million meals for mid-day meal programs by the time of the IPO. Lamps that were creatively designed by Happiest Minds during Diwali were auctioned and the proceeds shared with Sambhav Foundation. During the Joy of Giving Week Happiest Minds and Partners participated with pledges and wishes fulfilled at Akshara Foundation, Baalemane, Balajothi, Jeevarathini Foundation, Kilikili, One Billion Literates Foundation & Shishu Mandir. The team from Samarthanam Trust for the Disabled participated in our first Foundation Day with a dance presentation. Happiest Minds contribute at least one day’s payroll to the Uttarakhand relief work. Happiest Minds outside of office hours designed the website for JDC Sparsha Trust, an organization that extends services and expertise towards education and vocational training of special children. It is an immutable law that what we give, we receive. It’s not an exact exchange and may not always even be apparent. But it forms a full circle…a Circle of Happiness. The logo, the symbolism of our visual identity is possibly the first crowd sourced logo design in corporate history. The philosophy behind the company and its name were explained and people were invited to submit their designs. The contest generated a lot of excitement and we received over 1400 submissions. Of these, 150 were shortlisted and put for public voting on the basis of which 25 logos were selected and placed before a professional jury of eminent marketing and design specialists. The jury selected 5 appropriate logos which were vetted legally to prevent any future copyright violation issues. 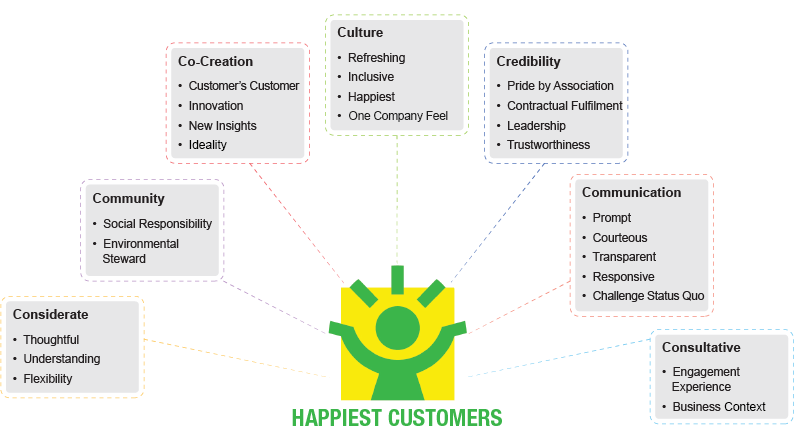 The winning design, the "Happy Person" came from Jemin Shingala, a Princeton, NJ (USA) based IT professional in a large IT company and was adapted to professionalize it by Shristi School of Design. Our Becoming, symbolized by the force lines above and around the head, signifying the energy and movement needed to forge into the future. Yellow and Green are the universal colours for happiness and peace. The visual with bright and friendly colours work together to signify a 'Happy Person'.